To commemorate the anniversary of the atomic bombings of Japan in August 1945, the Nuclear Vault is adding two documents to the posting: The Atomic Bomb and the End of World War II: A Collection of Primary Sources. Document 91 is a British embassy telegram from 14 August 1945, portraying President Harry S. Truman weighing the possibility of a third atomic bombing in Japan, hours before he received the Japanese surrender notice. 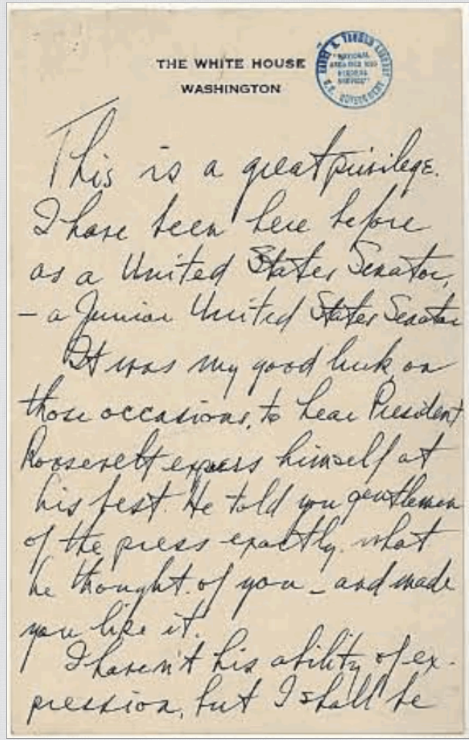 Document 96 is the text or draft of the speech that Truman gave to the Gridiron Club dinner in December 1945, in which he discussed his role in the decision to use the bomb and its devastating consequences. Both documents have been in the open public record for years, but they are worth including by shedding further light on Truman’s thinking and his early justification for the use of the bomb. 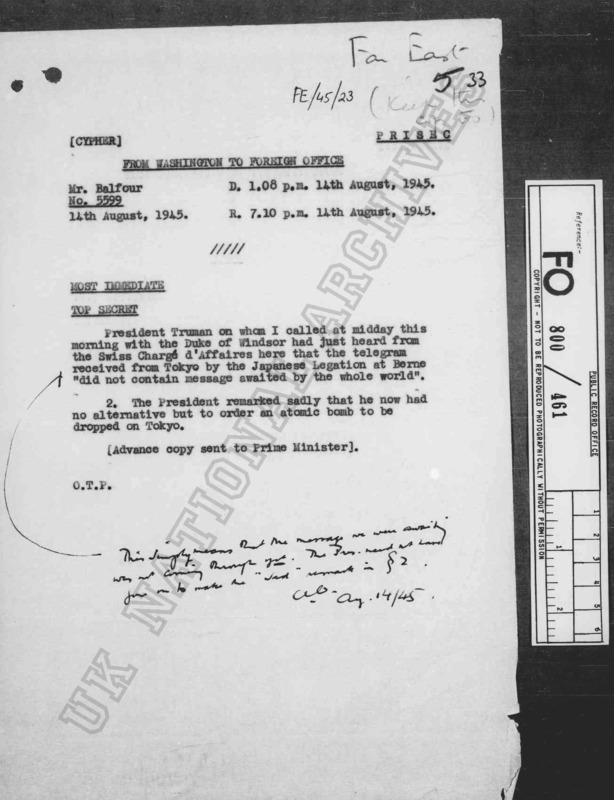 The British embassy telegram, sent by Minister John Balfour, depicts a mid-day discussion with Truman on 14 August 1945. Truman and his advisers were waiting for the official Japanese surrender announcement, but it had not yet arrived. During the course of the meeting, Truman observed “sadly that he now had no alternative but to order an atomic bomb to be dropped on Tokyo.” Truman may not have known that another bomb would not be available for use for another week. Moreover, the atomic bombing of Tokyo would have been a gratuitous act given that the March 1945 firebombing had destroyed the central city. In any event, such an option quickly became irrelevant because the surrender announcement arrived in a few hours that day. You know the most terrible decision a man ever had to make was made by me at Potsdam. …. It was a decision to loose the most terrible of all destructive forces for the wholesale slaughter of human beings … It occurred to me that a quarter of a million of the flower of our young manhood was worth a couple of Japanese cities, and I still think that they were and are. But I couldn’t help but think of the necessity of blotting out women and children and non-combatants. We gave them fair warning and asked them to quit. We picked a couple of cities where war work was the principle industry, and dropped bombs. Russia hurried in and the war ended. Plainly, Truman was troubled by the bombings, but he found the use of the bomb justifiable by sparring the lives of U.S. troops. The quarter of a million figure, however, far exceeded the estimate made by General Marshall in June 1945, which was in the range of 31,000 (comparable to Battle of Luzon) [See document 26]. By citing an inflated casualty figure, Truman was deploying the rationale that would become central to official and semi-official discourse about the bombings during the decades ahead. Despite Truman’s claim that he made a “terrible” decision at Potsdam, he assigned himself more responsibility than the historical record supports. On the basic decision, he had already concurred with the judgments of Stimson, Groves, and others that the bomb would be used as soon as it was available for military use. On a targeting decision, however, he had a role. At Potsdam, Secretary of War Stimson raised his objections to targeting Japan’s cultural capital, Kyoto, and Truman supported the Secretary’s efforts to drop that city from the target list.